Addressing the Social: Elizabeth Ashburn’s Artist talk at Articulate Project Space. This is the text of an Artist Talk given by Elizabeth Ashburn at Articulate Project Space (497 Parramatta Rd, Leichhardt. NSW) on Saturday March 15 as part of the exhibition Taking up Space. Articulate Project Space presented the exhibition Taking Up Space from 6 to 22 March 2015 as an event celebrating the launch of Future Feminist Archives by Contemporary Art and Feminism (CAF) to coincide with the fortieth anniversary of Women’s Day 2015. Artists were invited to respond spatially to an artwork from the women’s art movement in Australia. This call provided work from young emerging artists to those with a long history of art practice. Consequently the exhibition is diverse and reflects contemporary practice in art as well as continuing themes of feminist thought. It was accompanied by short artist talks by the participants and here I am speaking about my work Stop Slavery. I am passionate about many issues that are part of our contemporary world so, as an artist, I focused on developing an art practice to address social, rather than personal, concerns, but to do so in ways that remain valid artistically. A current concern lies in that of contemporary violence, such as war or torture. For over ten years I have been making art about the war in Iraq to examine the impact on civilians and combatants, as well as on children, women and the environment in this conflict. I struggle to find ways to make art that might engage an audience without supporting or glamourising or even fetishising war or violence. Does the continual exposure of violence through the visual media make art become just another contributory to this stream of images? Is art able to effect people’s perceptions and even their behaviour in ways to address the violence endemic within our world? And finally how can women be placed as other than victims, or worse, as invisible? Other artists in this exhibition have also used content that grapples with these issues. 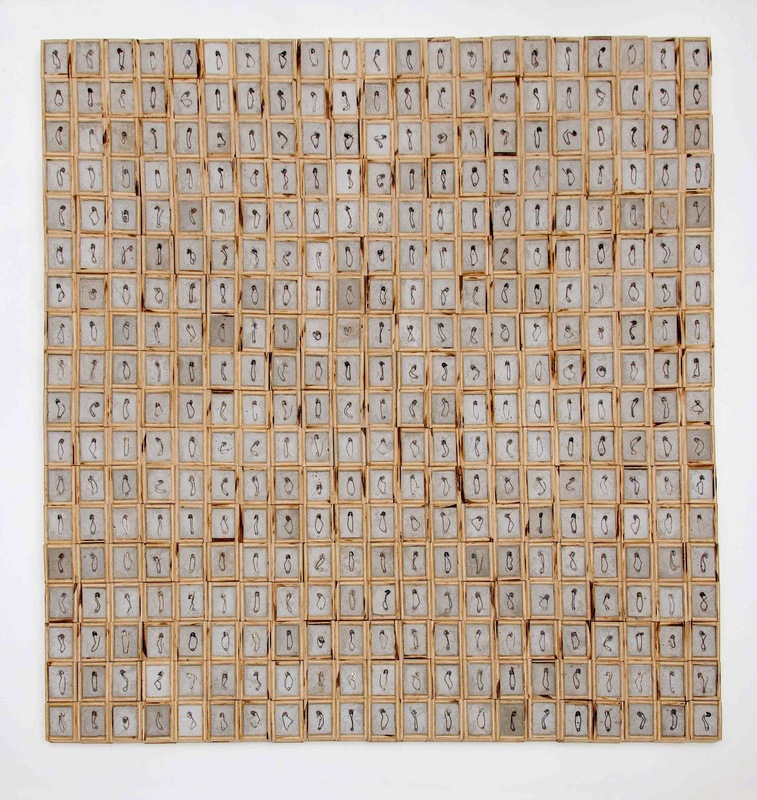 Che Ritz has made Cement Boxes 2010, a series of small wooden boxes filled with cement and burned, disfigured and reshaped safety pins, that are a visual response to the incarceration of young girls at Hays Girls Institute. 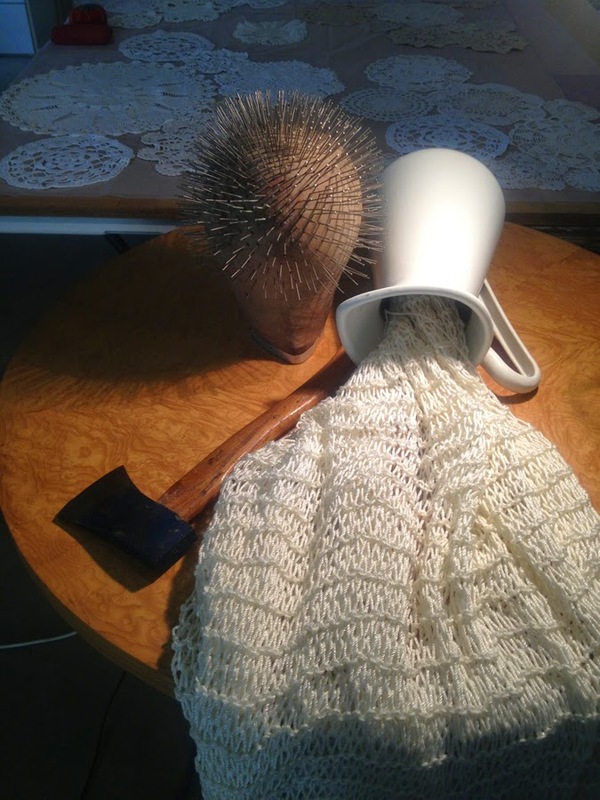 The area of female invisibility and devaluing of their work is addressed in Anne Graham’s She left the Table 2015 as a tribute to women in gaol or sweatshops where women suffer for protecting their own. 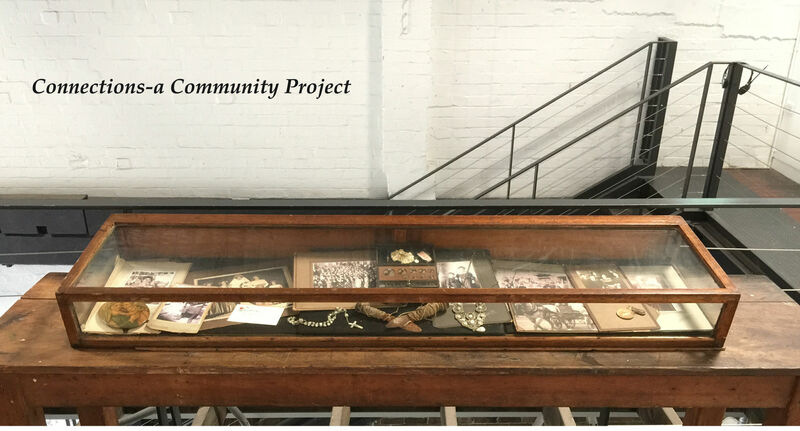 And in Vivienne Dadour’s Connections— a community project 2015 she showcases the largely unrecognised work of the early Lebanese migrant women who were considered undesirable participants and a hidden presence in Australian society 1900-1950. Phaptawan Suwannakudt’s work, Broken the Spell 2014 refers to the silencing and control of women in Thailand. Che Ritz. Cement Boxes 2010. Photo Emily K Parsons Lord. My piece in this exhibition, Stop the Torture of Women, grew out of my realisation that women throughout the world increasingly are subjected to torture both domestically and through state institutions. I have taken aspects of the work of Rosalie Gascoyne to create these two panels. She used recycled timber and fragments of language to create large word art works similar to puzzles, like crosswords or find-a word. Rather than using found objects I have used plywood, which consists of thin slices of wood glued and bonded together and I have further cut the ply into squares imposing further fragmentation. This once living material has been put through a process so that the being and spirit of a tree has been torn apart akin to the process of torture. 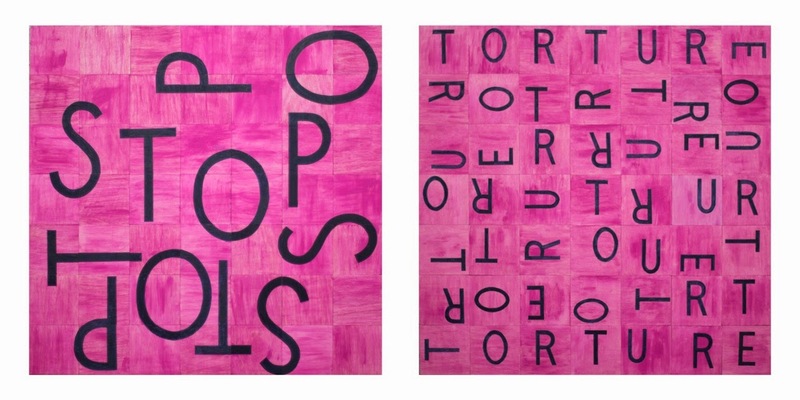 These square remnants have then been painted a strong pink, a colour culturally associated with the vulnerable female body. While the victim of torture in the collective imagination is generally viewed as male, women are increasingly raped, sexually assaulted, brutalised, killed and tortured. The message to stop torture is jumbled and fragmented to encourage the viewer to put the puzzle together and so to become aware of the need to act against the torture of women. In other words, in the view of the government of Australia, violence against women in domestic situations is not torture. Similarly they consider certain of their policies regarding internment falls outside UN conventions and cannot be regarded as torture. Tragically many other countries also continue to defy these UN conventions. Some countries increasingly torture and degrade women and these include China, many African and Middle Eastern territories and possibly the United States through its war on terror and this is why I created this art work. Elizabeth Ashburn has been involved in the education of artists since 1964. She is currently an Emeritus Professor at the University of New South Wales and a Conjoint Professor at the University of Newcastle. In 2007 she was awarded an Order of Australia Award for services to education, fine art, contemporary Australian art and to the community. http://www.lizashburn.com. This entry was posted in Articulate project space, Elizabeth Ashburn, Issue 13, Taking up Space and tagged Anne Graham, Australian Feminist Art, CAF, Che Ritz, Future Feminist Archives by Contemporary Art and Feminism, Phaptawan Suwannakudt, Visual Arts, Vivienne Dadour by Mark Roberts. Bookmark the permalink.